This week has been spent celebrating my 27th birthday, which was a funny one really. I find it both exciting and scary that I'm now the age I'll be when we become a family of four. I don't really know why it's such a big deal in my head, but I was the same when I turned 25 just before having Isabella. Maybe it's because it's an age I'll look back on in years to come, poignant ages when the most exciting life changing events happened. I've had quite a lot of cramping in my legs and feet this week, mainly when putting my tights on or at bedtime. It's something I don't suffer with at all outside of pregnancy, so I'm not equipped with the skills to get rid of them quickly. I'm learning though! My bump has continued to hurt this week, it's just the stretching and growing I think. The pain is mainly slightly above my belly button where it is becoming really firm now. I'm going to mention it to my midwife, as I have an appointment next week just in case it is something I should be monitoring more. Kicks wise there has been loads of moving around/kicks pretty low down. I still haven't manage to catch a movement on video and when my husband tries to feel the kicks she stops. I know as my bump gets bigger it will get easier to see/catch, so it's about being patient. 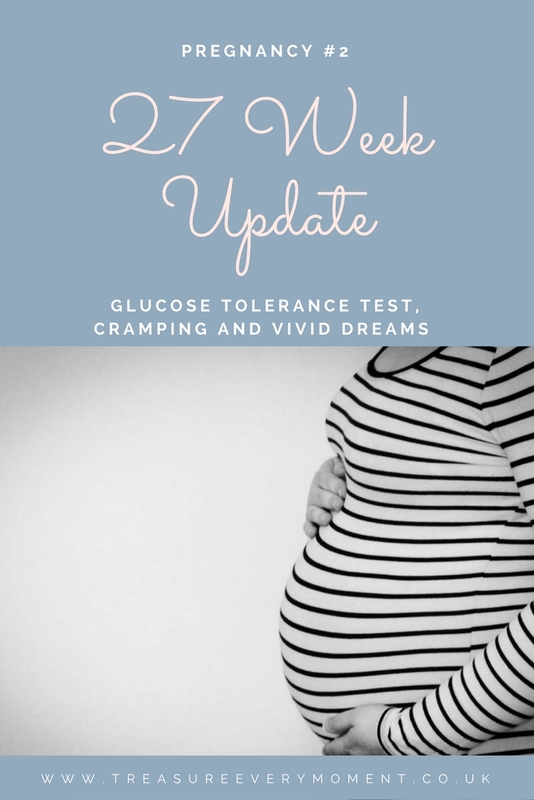 I had a glucose tolerance test at the doctors this week too, which was meant to happen when I was 24 weeks. The nurse taking my blood wasn't 100% sure what I was meant to do, so I relayed what I had been told on the phone when I made the appointment. A lot of mums I've spoken to were surprised I was having it at the doctors and not the hospital. To be honest I'm not entirely sure why I had to have it this time because I didn't with Isabella, but I was good and did as I was told. Bloods were taken at 9.20am, I was then sent away for 2 hours (though apparently I should have stayed there - glad they didn't make me because 2 hours in a doctors waiting room with a toddler would have been no fun), drank an original Lucozade, then returned for my second lot of bloods at 11.20am. It was a pretty simple process and all I need to do now is ring the doctors for my results. Sleep has been a bit of a nightmare this week, with one thing or another I've barely slept. Isabella was off nursery due to conjunctivitis, so I had to have a day off work and I was so worried about it. I've also been having some really intense, vivid dreams that have woken me up in the middle of the night and played on my mind. I've also been going to bed too late thanks to Broadchurch/The Replacement and doing work. I need to learn and go to bed early, though I'm not hopeful. Other than that it's been a pretty uneventful week pregnancy-wise. I've finally got a midwife appointment next week (first once of 2017!) where I should be able to hear the baby's heartbeat for the first time, eek! Did you have to have a glucose tolerance test? Oh I couldn't sleep during my third pregnancy! Feel for you! I had a glucose tolerance test twice during my third pregnancy. Is your BMI ok? I had my first one done at the midwife clinic and the second at the hosptial and I had to wait there, I wasn't allowed to leave! Hope the pain eases off soon lovely. All the best. I had a very good experience here with SOSav iPhone Repair. We had a great conversation and before you know it, he got my iPhone 6 screen up and running. I would mode go to him again if (God forbid) my broke breaks again. Great price! Great service! Nice man. Thank you SOSav for all your help……..